who you are and what you already know - but have forgotten! Option 1: Initiation into the Divine Feminine – 6 month program. Option 2: Priestess Initiation - 1 year & a day program. We already have this wisdom deep within us. It is already in your bones, your cells, your soul - calling you. It is time to remember what has been forgotten. I know as you sit in nature you feel it. Initiation is the process through which we claim our sovereign nature as a manifestation of the Divine Feminine, the female aspect of spirit incarnate. Inherent in our Divine Feminine nature lives the wisdom of all times, all nature, and the mystic realms. Why am I offering this program? I heard the call at a young age and took the Vow of the Priestess decades ago. Remembering has changed my life. Remembering has awakened in me a deep and powerful knowing of who I am. Remembering has awakened in me the collective presence of all the women who have walked, prayed, chanted, danced, laughed and cried together since the beginning of time. They are a part of me. They are within me. They walk with me and I with them. Remembering has empowered how I live in my skin as a woman. Remembering has enabled me to consciously live in synch with the cycles and rhythms of nature and to tap into the power of creation. Remembering has increased my juiciness as a woman. Remembering has awakened endless changes in my experience here on earth! 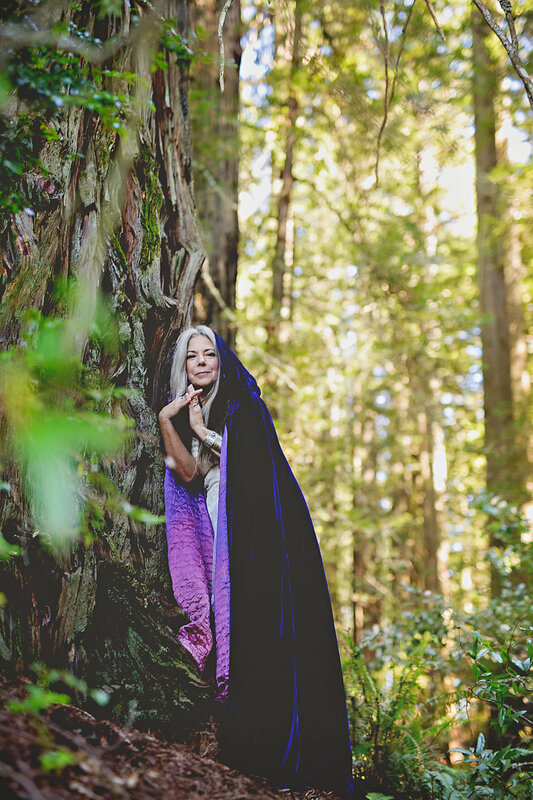 I am a Feminine Shaman/Priestess and I have spent much of my life leading ritual circles, women’s sacred circles, rites of passage celebrations for Maidens, Mothers- Queens and Crones, Women’s Initiation & Priestess programs, moon lodges, women’s lodges, as well as decades working with women in my practice as a spiritual guide, psychotherapist, Energy & Sound healing practices, and Highest Good Coach. My first book, which I wrote with my amazing co-author Linda Wolf - Daughters Of The Moon - Sisters Of The Sun: Young Women & Mentors On The Transition To Womanhood, includes powerful stories of young women, and wise women mentors including: Maya Angelou, The Indigo Girls, Angela Davis, Starhawk, Marion Woodman, Lindsay Wagner, Michelle Akers, Bella Abzug, Wilma Mankiller and others. My most recent book - Life Is The Ceremony: How We Live It Is the Ritual - The Journey Of A Feminine Shaman chronicles my life and teachings as a Shaman/Priestess, the mystical visions and my journeys inter-dimensionally. It is essential now that as many of us as possible remember, and I am committed to guiding as many women as possible to the core of this remembering. It was a long time ago when these were our WAYS. We are called to recreate this in our lives so we may live fully from within, from the power that moves inside of us. We are called to connect with other wise women in these WAYS again. Initiation into the Divine Feminine – 6 month program. This is for all women wanting to awaken to their Divine Feminine Sovereign Nature, awaken the memory of the practices of Earthbased traditions, - the Ways Of Women, and to learn how to align with these energies to empower their lives. It covers all of the content areas listed below. Priestess Initiation - 1 year & a day program. This advanced program is or women who are called to study more deeply into the wisdom, and to prepare for taking the Vow of Priestess. A Priestess, as with any other spiritual leader and healer, studies their chosen practice, cultivates healing modalities, and takes a life long vow of service and commitment to live as a spiritual beacon on their own unique path. It is the women who will lead the way towards personal and planetary peace and transformation. Once we make the choice to awaken and remember this wisdom our lives will never be the same. In earlier times the Initiation process took many years of study with an elder, a priestess, shaman, medicine woman. In current times our access to information and ability to communicate through technology, and the collective shift of consciousness, allow for this process to be accelerated. If you choose to take the Vow Of The Priestess it is essential, as it always has been since ancient days, that you study with an Initiated Priestess, Shaman, Medicine Woman who has extensive experience walking the Priestess path. This knowledge is powerful and must be used wisely and in accord with light and love – for the good of all. We need each of you who are called to step up and claim your place, as women throughout time who have come before you have done. The most essential step is what takes place in your own heart. If you have listened closely and feel the call in your heart and soul then the time is right. All you need now to do is seek the support to guide you on your way. I invite you to dive in to the depths of your wisdom and live your life as the Empowered Divine Woman you are. Most cultures have some form of Sacred Wheel that teaches the wisdom mirrored in the cycles and elements of nature, and the Natural Cosmic Laws of Creation. This wisdom is used to guide our lives, ritual and ceremony, for healing and for moving between the worlds. Pagan, Wiccan, Gypsy, Celtic, African, Shamanism and other traditions draw from the wisdom of the Sacred Wheel. The program integrates the ancient Ways Of Womyn by weaving these areas into a practical and accessible body of material. We will incorporate a combination of Earhbased traditions with an emphasis on Pagan, Celtic, Wiccan & transcendent traditions. You will develop a keen awareness, and cultivate tools, enabling you to align with the powers of nature, the mystical energies mirrored in nature and in quantum physics. Modern science has embraced these teachings in the form of Quantum Physics. Though the program provides you the information you will need, the process is very personal and individualized. Bi-weekly - Inspiring, informative, reflective on-line materials and exercises to guide you as you dive deeply along this journey. E-mail support as you work the exercises during each two week period. Bi-weekly check-ins with Wind via Skype, video chat, or phone. Which Course Option are you Interested in? Option One - Initiation into the Divine Feminine – 6 mo. program. Option Two - Priestess Initiation 1 year & a day program. Thank you! Wind will be in touch with you soon, to complete your registration process.